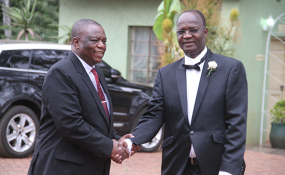 In happier times Jonathan Moyo (right) and Vice President Constantino Chiwenga (file photo). Emmerson Mnangagwa manipulated his way to become vice president at the Zanu PF congress in 2014, deceitfully side-lining party stalwart Oppah Muchinguri, a former cabinet minister has claimed. Exiled former higher education minister Jonathan Moyo insisted that Mnangagwa and vice president Constantino Chiwenga were still "baying for my head ... that is still their plan to this day". Moyo lifted the lid on some of the Zanu PF treachery leading up to the November 2017 coup in a weekend interview with UK-based academic Alex Magaisa. The former cabinet minister revealed that he was very close Chiwenga, working with the then Zimbabwe Defence Forces (ZDF) chief from 2010 through to the 2013 election campaign. But they then fell-out spectacularly over Chiwenga's conspiring with Mnangagwa in the latter's bid to succeed then president Robert Mugabe which escalated with the 2014 dismissal of vice president Joice Mujuru. "The movers and shakers and the brains behind the firing of Joice Mujuru in 2014 were Chiwenga and Mnangagwa," said Moyo. "... Chiwenga, Mnangagwa, and President Mugabe acted in, and with, a common purpose against Joice Mujuru in 2014." According to Moyo, the had party expected that Mujuru would be replaced by Muchinguri in line with a constitutional stipulation requiring that one of the two vice presidents must be a woman. "... it was always clear that Mujuru's replacement, in the event she was removed from office as vice president, would be Oppah Muchinguri. This was the deal. The idea that a man would replace a woman was a no, no. We all understood that," said Moyo. Unbeknown to Moyo and others however, Mnangagwa and Chiwenga had other ideas. "Closer to the December 2014 Congress, about two or so weeks, inexplicable concerns started mushrooming about Oppah Muchinguri's suitability as a replacement for Joice Mujuru. "Mnangagwa asked me to remove from the (constitutional) amendments we were working on the provision that 'one of the two vice presidents shall be a woman'. "He said this was a directive from President Mugabe. This was the bombshell that caused the fall-out (between Moyo and Mnangagwa). I could not believe my ears." General Chiwenga also backed Mnangagwa's bid for power and this is what soured the "very close" relationship between Moyo and the ZDF chief. "... between 2010 and 2014 I became very close to Chiwenga. Very close," the former Zanu PF politburo member explained. "Things dramatically changed after the December 2014 Zanu PF Congress that elevated Mnangagwa to Vice President. "Thereafter, each time an issue came up about the party or government, Chiwenga would ask me if I had checked with 'Shumba' (Mnangagwa's clan name)." Moyo continued; "Suddenly, everything was Shumba this and Shumba that. "I was uncomfortable and unwilling to subject myself to the Shumba regime when my appointing authority was President Mugabe. "I was also aware of the shenanigans that had taken place for Mnangagwa to become Vice President ahead of Muchinguri. "My unwillingness to subject myself to the Shumba regime is the reason there was a total and complete fallout between Chiwenga and me." Moyo, who is believed to be now based in Kenya, has remained in exile since dramatically leaving the country after his Harare home was attacked by soldiers as the November 2017 coup was underway. The former cabinet minister said he is currently writing two books, one an autobiography to be released next year, and the other a "major academic memoir" expected the be published in 2020.